Different karmic affinities bring us to this world, but it is up to us whether we create more positive affinities and sow more blessings during our sojourn on Earth. If we can make the best of our abilities to benefit the world, we will be like a lighthouse that triumphs over darkness and guides lost vessels to shore. Late January this year saw the passing of Eka Tjipta Widjaja, the founder of the Sinar Mas Group in Indonesia. Mr. Widjaja was a man of great wealth and benevolence. Instead of seeking solely to expand his businesses, he believed in contributing to the welfare of people and society through his enterprise. He educated his children with the same conviction. I still remember that when anti-Chinese riots erupted in Indonesia in 1998, leading to social unrest, Widjaja asked me what to do. My reply was: “Only love can quell disasters and heal wounds.” My words prompted him to use resources from his business conglomerate to help the underprivileged in Indonesia. He even introduced the philanthropic ideals and work of Tzu Chi to other business people to motivate them to do good together. Four years later, in 2002, Jakarta was hit by severe flooding. One of the worst-hit districts was Kapuk Muara, on the Angke River. The village, consisting of many illegally built ramshackle houses, was submerged in floodwaters for over a month. If the area were not quickly cleaned and an epidemic broke out, the consequences would have been unthinkable. I asked Widjaja at the time to lead a cleanup effort, and he readily agreed. He was already in his 80s at that time, yet he personally participated in the cleanup, shoveling garbage and sludge. His dedication was truly admirable. Thinking back now, he motivated many people to work harmoniously together to do philanthropic work. He really contributed a lot to Indonesian society. He was an elder I held in high esteem, and he gave me a lot of support in things I wanted to do. Tzu Chi missions in Indonesia have won a lot of support from the Indonesian government and military due to the foundation he laid with his personal example. Thanks to him, many local entrepreneurs have worked in unity to help the needy. 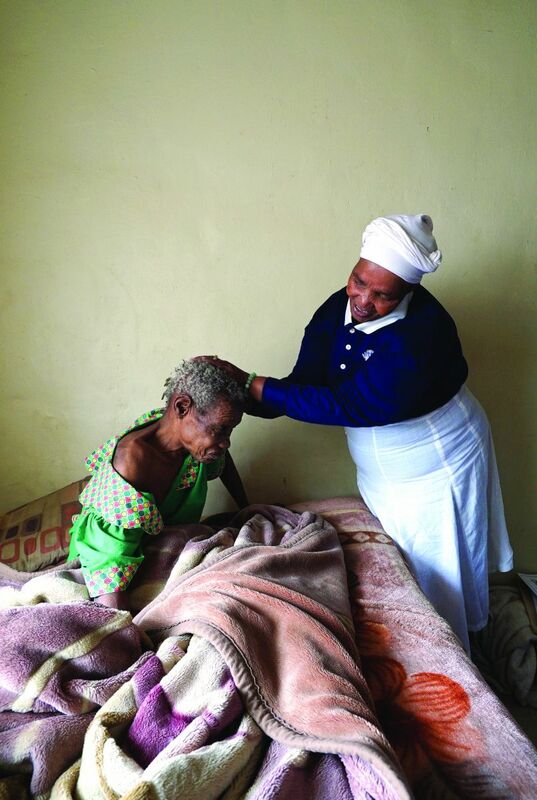 On the same day Widjaja passed away, Abegail Cetyiwe, a volunteer in South Africa, also departed from this world. Cetyiwe was a devoted disciple of mine. Wise and loving, she often said she would love all people that I love, and she lived out her words. She couldn’t move around as easily as most people, but she didn’t let that prevent her from visiting the needy. Difficult terrain couldn’t daunt her, and she even traveled to other African countries to do Tzu Chi work. She volunteered even when she was under the weather. She was a living bodhisattva with a steadfast dedication to doing good. She took seriously ill at the end of last year. Her condition was so critical she was close to death, but she regained her stamina after she dreamed of me putting a set of prayer beads on her wrist. Though she had obtained a set of prayer beads when she came to Taiwan to receive her volunteer certification from me, she had lost them on a trip outside of South Africa to do Tzu Chi work. The dream filled her with such joy she experienced a burst of energy. She even felt well enough to volunteer for several more days before peacefully passing away. She had indeed upheld her pledge to walk the Bodhisattva Path until her last breath. None of us knows how long we will live, but regardless of the length of our lives, if we can head in the right direction and make good use of our time by doing good and creating a better life for others, we will be at peace when our time comes. Let us endeavor to bring light to the world. We’ll live a life of great value if we can light up the dark corners of society with our love and actions, just like a candle dispelling the darkness in a room.